Its Tuesday again and another challenge from Everybody Art. This week the theme is Summer. I have made my card for my Nephew, its his birthday in a few weeks so I am ahead of time for a change. The image is a digital stamp purchased from Digitalpenciltoo and its one from the big guy range. I have coloured him using copics and the background clouds with distress inks. 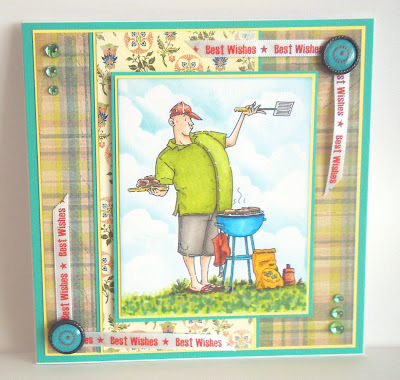 I have layered K&Co and Basic Grey paper on yellow card and Spearmint bazill card. The embellishments are brads, gems and best wishes ribbon. Oh he is brilliant Jenny, great card.